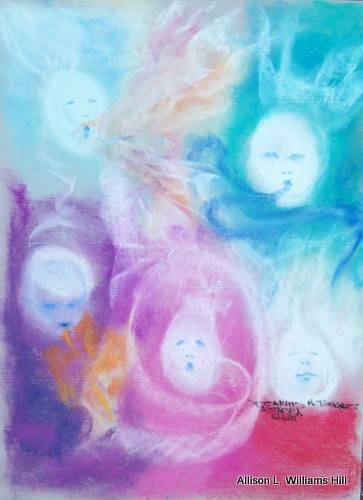 The “Gifts From Spirit” series soft pastel on charcoal paper was a project that developed in mind after I read about them in one of Dr. Caroline Myss’ book. I selected the Corinthian version because “…they are available to all in the Body of Christ given at the time of need for the purpose at hand.” They were available to all people. The Romans’ Gifts were given by God; the Ephesians Gifts were given by Christ to the Body of Christ. The latter are not as extensive as the Corinthians’ group. I think this group of Gifts is wonderful; they would emerge when we experience our lives and our lessons. I kept wondering how the images would look. Using Entura to open my heart brought forth interesting images. 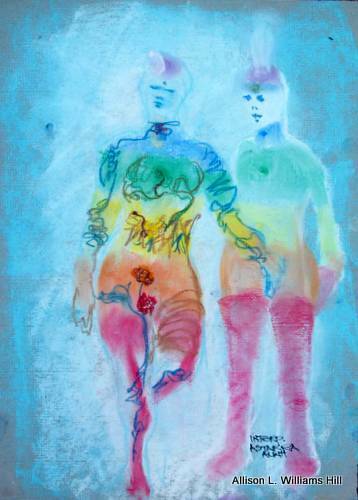 “Wisdom” soft pastel on charcoal paper developed into the male and female joined energetically at the head. The male holds a chord and his left hand towards the funnel with a ball of light. Wisdom is a balance between spiritual insight and practicality. The eye above the energy funnel is the sixth chakra energy center, the “Third Eye” where vision is boundless. “Seeing” brings in knowledge that is available but is not on the Earth plane. 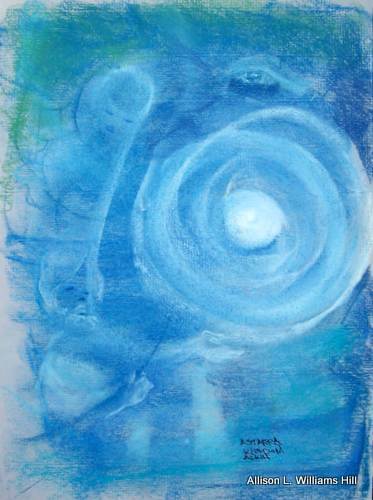 “Knowledge “soft pastel on charcoal paper is kinetic and dynamic connection to the Mighty I AM Presence. We are all, first and foremost, Divine in nature. Our connection to our brain is established through our crown chakra. All knowledge for all, before we even learn to communicate in our specific cultures, begins in Spirit. 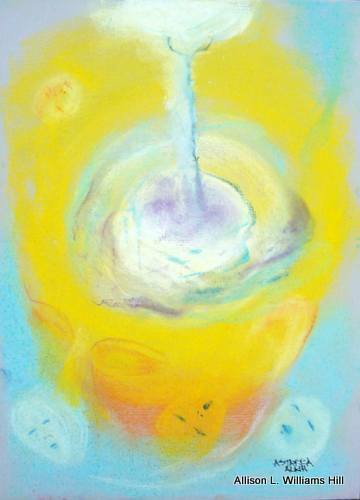 “Discerning Spirit” soft pastel on charcoal paper shows orbs of energy surrounding a being in an energized state. She is aware of each of the orbs surrounding her. The physical body plus her other bodies –mental, emotional, and spiritual – are apparent as she uses them to distinguish between the orbs that move within her aura. “Interpretation of Tongues” soft pastel on charcoal paper shows how we can listen or not and the effects of not receiving the information. We listen on many levels, the physical receptor is only one of them. The energy centers, or chakras, are gnarled with “cords” and result in malformed wheels with distorted feeds to sections of the body and corresponding organs that result in discomfort and disease. The smiling figure to the right receives spiritual information freely and it is reflected in the body. 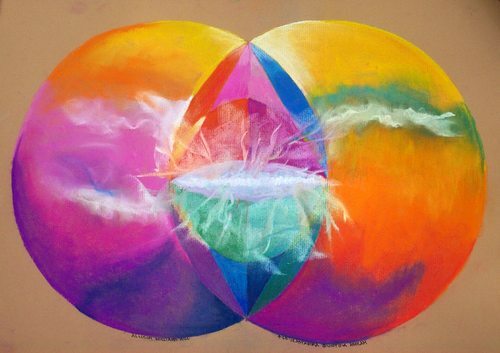 The “Prophecy” soft pastel on charcoal paper evokes a feeling of appreciation for one’s abilities to connect and see what “is.” There is no anxiety. There is peace in the access of information in relation to one’s needs, the events of the world. All that may come to pass is available. I feel that, as I understood the explanation from my teachers at Delphi, events unfold but the Divine’s influence will influence the outcome. 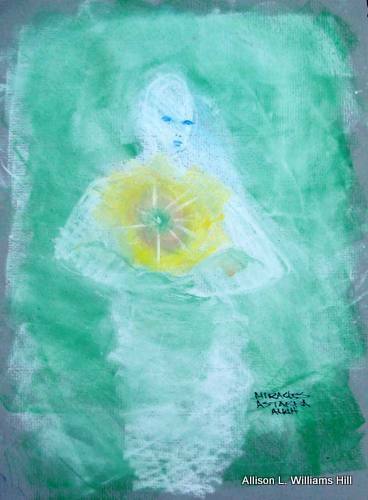 “Miracles” soft pastel on charcoal paper is heart-centered. Her heart is beaming energy from which the corrections, or miracles, originate. Love flows from the heart chakra and noticeably transforms anyone toward whom this energy is directed. This energy changes thought, feelings, attitudes, and the gross physical. 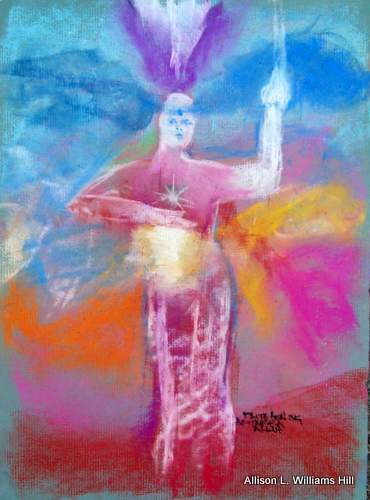 “Faith Healing “ soft pastel on charcoal paper being has her “female, healing side” receiving hand towards the Creator accepting energy. Her “masculine action side”, the right hand, radiates the energy towards its intention. Her chakras radiate the energy moving through her to dispense for the purpose of healing self or others. She is grounded with the Earth and root energy. She is aware of guidance and connected to the Divine. Most of all, she knows that she is aligned with Divine Guidance and that the applications will manifest. EEntura means "enter the aura". 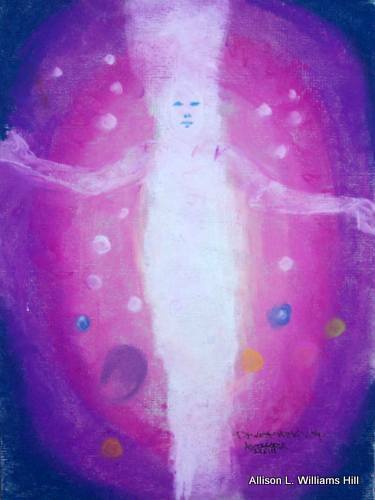 A person accesses the subtle energy plane and the feelings sensed from there take on form and color. Using meditation and writing, the drawing is interpreted for its use of color, shapes, and images that appear. Entura art is an interesting and exciting way to connect with the multiple levels of our being. 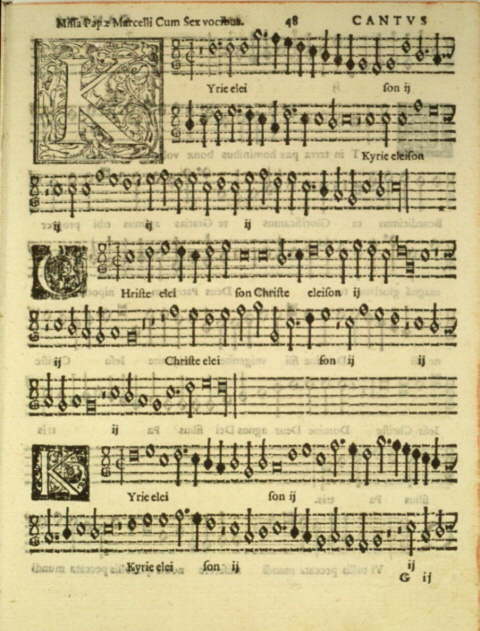 The interpretation of the image could provide relevant messages and can be used for meditation. I would be happy to create an image for you based on a question or on your energy reading. Other images are displayed at In-Vesica. "Do All Things In-Vesica." Art can be issued as digital photos you can download, print and mount. If the physical art work is desired, please add $7.00 for shipping and handling. The art work that is only given in its physical form are noted. A meditation question is given by the client.A written response is produced, the image is drawn and then interpreted. You may request a healing mandala created in accordance with your question. It is understood that this may be a timely issue, therefore, a digital product is provided. If the physical art work is desired, see note above for shipping and handling. You may request a healing mandala created in accordance with your question. This drawing will be specific to your needs at this time. You may use it for meditation. You will be provided with instructions about how to use it. 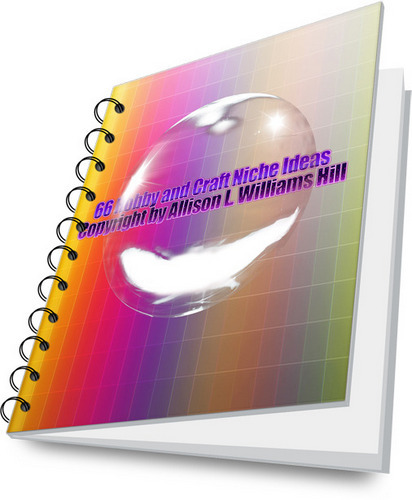 It is understood that this may be a timely issue, therefore, a digital product is provided. If the physical art work is desired, see note above for shipping and handling. Soul Portrait is the most in-depth of all of the art images because of vastness of a soul. A soul portrait is information that draws from everything the soul did in all of its lifetimes. The information that comes is what is relevant to the person in this time, at this time. 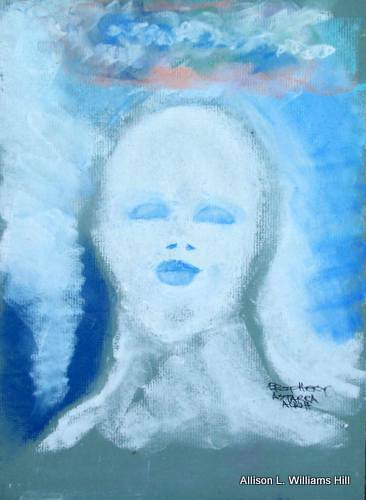 As with all intuitive orders, Soul Portraits will be meditated on and created in the order the request was received. I suggest you email me first here to see what orders are in place before you order. These Birthday Cards show an answer from Spirit for the birthday of the client. The image is drawn on 8" x 10" charcoal paper; the text is printed on cardstock with colors to give the impression of an ancient text.